In this post we will take an in-depth look at the final ten games of the season. Ostersund sit in 9th position after 20 games and are struggling in their quest for continental qualification. In the current 2020 Swedish League 4th place and above qualify for Europe, so Ostersund really need to improve to move up the table. Jonkopings Sodra have finished in 4th, 7th and 9th in the last three seasons and are a team that we have a fairly decent record against, winning 4 of our last 5 games against them. We started the game brightly, dominating possession in the early stages of the game. In the 20th minute our central midfielder, Eric Smith, went in on an opposition player with a two-footed tackle = straight red. From this moment forward our dominance in the game came to an end and we struggled for possession. Jonkopings Sodra scored the opener in the 52nd minute and held on for the win, despite a late charge from our tired team. Hammarby have gone from being a regular mid-table side to being one of the challenges for the title. In 2019 they finished 2nd and this season they are battling Malmo for 2nd place (behind Norrkoping in 1st). 12 minutes into the game and we are 2-0 down, the game was effectively gone. Though we then started to come back into the game towards the end of the first half, we couldn’t find that crucial goal to get us back into the match. Hammarby scored a third in the 68th minute and we could only manage one consolation goal through Angel Gomes. 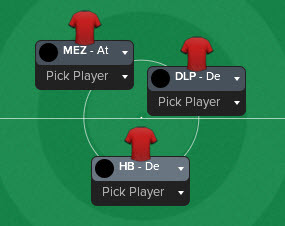 Since our post back in Season 2 on our Dutch 4-3-3, we haven’t really had the need to tinker with the tactic too much. But with 30 points from 22 games I couldn’t go any longer. But instead of making wholesale changes and switching the formation completely or adding a load of different instructions, I’ve simply changed the player roles for two players in the formation. Our old midfield three contained a deep-lying playmaker in the DM role and a Mezzala and advanced-playmaker in the CM positions. The only change made was to push the DLP forward into the CM position and changed the DM to a half-back. In doing so I hoped to add a bit more defensive solidity with the HB but retain my sides creativity by having a DLP in central midfield. Whether I can attribute our result against Malmo to this change I don’t know, but we beat the Swedish giants 3-1 away from home. We led 3-0 by the 55th minute before Malmo grabbed a consolation goal near the end. It was in this game that our star striker Steffen Lie Skalevik sustained a broken ankle, meaning he would miss the rest of the season. With Skalevik out injured and Denis Avdic, our backup striker, suffering from a torn hamstring we were left with 18-year-old Louis Mbarga to lead our line. We struggled for any forward momentum in the first half against AIK and got lucky with a brilliant ten-minute spell in the second half where we scored three goals. Mbarga scored the opener (his first for the club) and ended the game as the player of the match. Helsingborg are a team we should beat easily. So far in Oscar Friberg’s career with Ostersund they have yet to drop points against Helsingborg. And following two great wins against Malmo and AIK anything other than a win would be a failure. We conceded a penalty in the 12th minute and fell behind as a result. From here we struggled to assert any sort of dominance and managed just one shot on target in the entire game. Luckily for us it resulted in a goal. Louis Mbarga, despite not having any real effect on our team in attack, won his second consecutive man of the match performance with another 9.0 rating. With just five games left in the season, we couldn’t afford to drop any more points. Though we are sitting in 9th position, we are only a few points off the teams ahead with two games in hand over many of them. Winning both of our games in hand would see us rise to 6th and within four points of 4th. Once again, we struggled in attack and went the first half goalless. In the second half we came out fired-up and ready to battle for victory – and that we did. Inside-forward Jonathan Levi opened the scoring in the 57th minute before Louis Mbarga scored a second. This was how the game finished. A very important game against Goteborg came three days after our win vs Halmstad. Goteborg were six points ahead of us having played just 1 game more. Lose here and we’d be at least 6 points behind with just 3 games left. Win and we will move up in the league and be within three points of Goteborg in 6th with a game in hand. For the 4th game running we failed to score in the first-half and it took until the introduction of Denni Avdic, back from his torn hamstring, before we scored the opener. The game was very even up until then and either side really could have won it. Avdic pounced on a mistake from the opposition to score in the 78th minuted before he slotted home a penalty just two minutes later. Two consecutive 2-0 wins: so important for us to take all points available from our home fixtures. Ostersund have beaten Brommapojkarna in each of their three previous meetings in Oscar Friberg’s managerial career. In those 3 games Ostersund scored ten goals and conceded just 1. A win here would see us rise to 7th in the league with 2 games to play. Young Cameroonian Louis Mbarga scored two goals for us with Denni Avdic adding a third to help us beat our opponents. However, despite this win our victory celebrations were put on hold with news that our striker Mbarga had suffered a pulled groin and would miss the final two games of the season. For the first time on this years FM, I decided to give Mbarga a course of injections to help him through our next game against top of the table Norrkoping. Without Mbarga we’d be left with Denni Avdic and not much else. We need Mbarga. With all the talk being around Louis Mbarga pre-match, it was Denni Avdic who made headlines in the aftermath of the Norrkoping fixture. Mbarga was left on the bench and Avdic started. He repaid his managers faith in him by scoring the opener after 25 minutes. In a largely even game with no clear-cut chances to speak of, one mistake could be crucial. 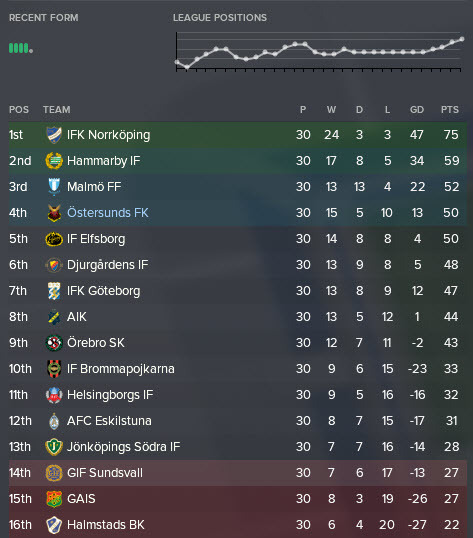 Norrkoping had only lost 2 matches in the league up until this point and had already secured the league title. Ostersund, on the other hand, have been under pressure for most of their previous ten games or so to take advantage of their games in hand to rise up the league table. Gabriel Gudmundsson doubled Ostersund’s lead in the 53rd minute and his side managed to hold on for an unlikely and hugely impressive 2-0 victory. Coming into the final game of the season, Ostersund sat in fifth place, knowing that even a win against Goteborg wouldn’t guarantee a 3rd/4th place finish. Malmo (in 3rd) were to play Djurgarden and Elfsborg (4th) were to play Norrkoping. A win for Malmo would see them finish on 54 points, a win for Elfsborg would see them finish on 53 points and a win for Ostersund would mean they would have 52 points. However with Elfsborg playing Norrkoping, a loss for the 4th place side would see them finish on 50 points, meaning a draw for Ostersund would be enough for them to overtake Elfsborg into fourth on goal difference. Make sense? So, falling behind to a 23rd-minute goal was a horrible feeling, especially when Elfsborg then fell behind to Norrkoping. Would we really throw away the hard work of the previous 7 matches to see our side finish 5th? It certainly looked that way. Late on in the second half and still trailing 1-0, we sent on Louis Mbarga to partner Avdic in a front two. We needed a goal; Elfsborg were two down a certain to lose – 1 goal for us would see us finish 4th! This is what Football Manager is about. All of your decisions culminating in a 94th-minute equaliser to secure European football for the following season. Louis Mbarga, only playing thanks to injections, scored an amazing goal to secure us the most important point of Oscar Friberg’s career so far. My reaction to this goal was complete shock. I didn’t jump in the air celebrating, I didn’t shout or scream. I sat in silence and couldn’t believe my eyes. To have battled so hard for the last 7 games, unbeaten since our loss to Hammarby and to see us seemingly throw it away was a crushing feeling. Having thrown everything at Goteborg to no avail and for the ‘end of game’ highlight to have started I knew defeat was incoming. And Football Manager shocked me. Thank you very much for reading another instalment of our Football Manager 2018 story here on VivaLaVidaFM. What a save this has been, I’m absolutely loving it and I hope it shows with my writing. If you enjoyed it, do leave a like or a comment, let me know what you think of our save so far. This entry was posted in FM18 Stories, Football Manager 2018, Oscar Friberg, Ostersunds FK | @VivaLaVidaFM and tagged fm stories, fm18, football manager, Oscar Friberg, ostersund, sweden, swedish allsvenskan. Bookmark the permalink.